Just one of the many veg-centric recipes from Chef Jon Cichon of Lacroix and his seasonal pop-up, Aubergine, at The Rittenhouse. After a brutally long winter, al fresco dining is finally happening and trips to the farmers market are pleasantly warm and sunny. To celebrate, we’re sharing some veg-centric recipes from chef Jon Cichon of Lacroix and seasonal pop-up Aubergine. 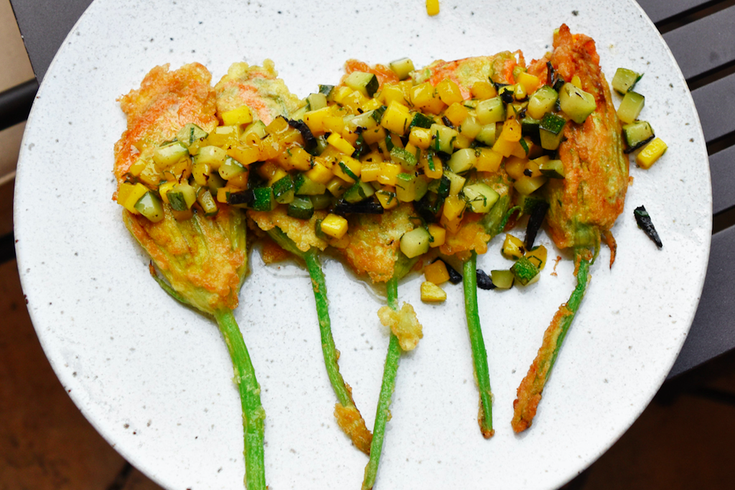 Both restaurants put a spotlight on vegetables in their own way, a natural extension of Cichon’s interest in lighter, seasonal fare. “For me, that’s just the way I like to eat,” he says. To keep Lacroix’s six-course tasting menu fresh, Cichon recently switched up the format. Now, each month starts with a completely new menu organized around one peak-season vegetable, like peas in May and summer squash in June. “It’s a good story and a way for us to use all the parts of the vegetables,” says Cichon. In asparagus-focused April, for example, he ground roasted blackened spears into ash to use in a rub for lamb. 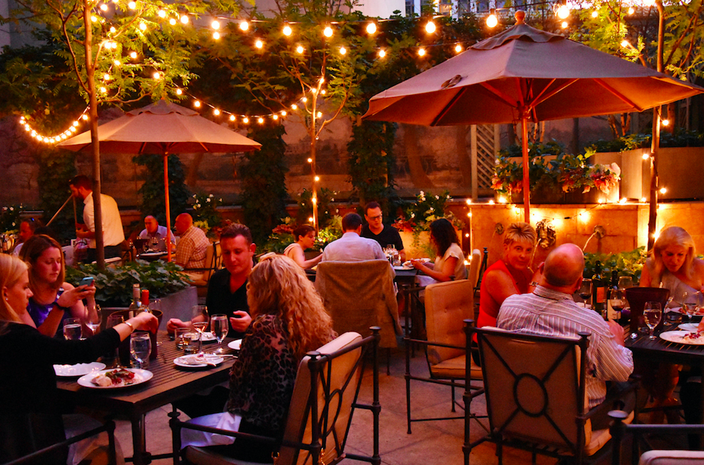 Downstairs in The Rittenhouse’s outdoor courtyard, Cichon is again hosting Aubergine, a once-a-month pop-up restaurant with just 24 seats. “The inspiration behind it was an attempt to do the opposite of what Lacroix is,” says Cichon. It’s a more casual setup with family-style service and wine bottles on the table. The menu is about 90 percent vegetarian and based on whatever produce is at its peak. Aubergine dinners generally run on the third Thursday of the month through October; the next one is on June 14. To book a table for four for $59 per person, call 215-790-2525 on the first Monday of the month. 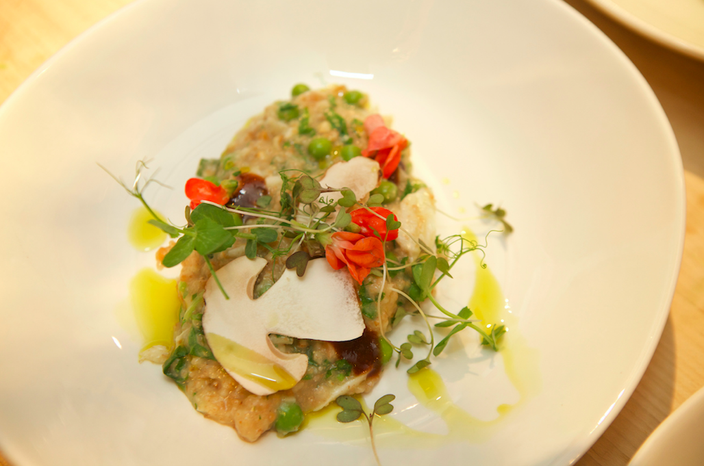 Cichon prepared this hearty vegetarian dish at the James Beard House last year. It’s similar to risotto but features Einkorn wheat, which has a distinct nutty flavor. Feel free to swap out the Einkorn for another whole grain like rye berries or wheat berries--just adjust the cooking time. Fava beans, snap peas and asparagus are great substitutes for the English peas, says Cichon. In a medium saucepan, sweat the onion and garlic in olive oil until tender. Add the Einkorn and cook for 5 minutes. Deglaze the pan with the wine and cook until the wine is fully absorbed. Heat the mushroom stock in a small saucepan and add a ladleful at a time to the Einkorn. Continue to add stock as needed, letting it absorb with each addition, to achieve a porridge like consistency (about 30 minutes). The porridge should be tender and not tough on the tooth. To finish, add the English peas, pea leaves and mint. Finish with butter, if desired. Season with salt and pepper. Serve with tamarind glazed porcini or other mushrooms. Lacroix's seasonal pop-up, Aubergine, at The Rittenhouse Hotel. This tangy glaze goes well with mushrooms as an accompaniment to the risotto, but it also works with a variety of vegetables. “The black bean and the tamarind give you that nice, savory, salty component,” says Cichon. In a small saucepan, sweat the shallot, garlic, and ginger in olive oil until tender. Add the black beans, tamarind paste, chili and 1 cup water. Simmer for 20 minutes. Puree and season with lime juice. Serve with sautéed porcini mushrooms or other vegetables.